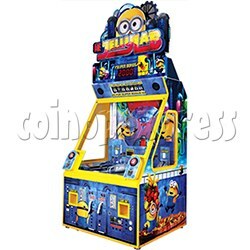 Despicable Me Jelly Lab Coin Roll Down Arcade Game machine is a self-contained coin roll down arcade game and collectible card dispenser, it is a great new redemption piece by Andamiro, based on working at the famous laboratory of the Minions from the hit film franchise, features with two conveyor belts with different values placed on to them, the game merchandises eight slick Minion cards, one of which is a special "foil" edition of Stuart. A "super bonus" is awarded when a player collects the seven standard cards. - players time the drop of their tokens by pressing a button to try to land on the best value targets possible – ticket values or "Win Card" – that continually loop on a conveyor belt system. - That involves playing for all seven, collectible cards. Collect all seven and you’ll win the posted SUPER BONUS! - Also, keep an eye out for the foil-based card featuring beloved Minion ‘Stuart’!